What a whirlwind day! Tuesday 5/9/17 was a day I will never forget! "Madra", Aust Ch Steadfast That Ol' Black Magic E.T. wins BEST OF BREED at Adelaide Royal. Thankyou to our Swedish Judge Mr K Nilsson who also gave him such a lovely critique afterwards. Madra really had to work for this win, being moved so many times around the ring, but as someone stated, he "owned the ring". This boy never disappoints! 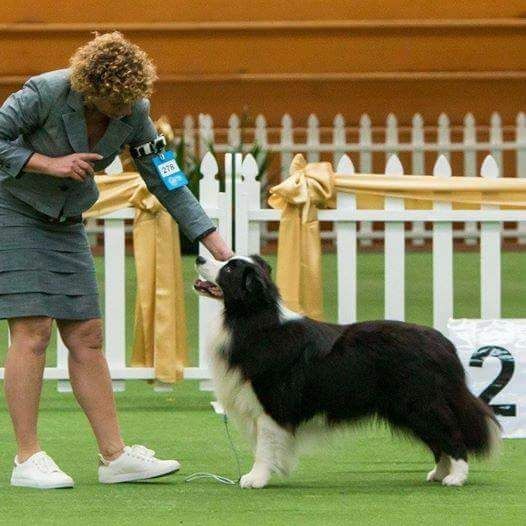 Of course this meant a trip back to Adelaide on Sunday 10/9/17 where Madra had to compete in Group Specials, under the same Judge. Again, he performed faultlessly and was awarded a noteworthy BEST EXHIBIT IN GROUP - 4TH!! !